If you ever lived in a tiny studio, you know that carving out space for your essentials, not to mention an average-sized sofa or table for four, can be challenging. This quirky Madrid apartment, owned by Dido Fogué, is full of unique solutions for common small space problems. 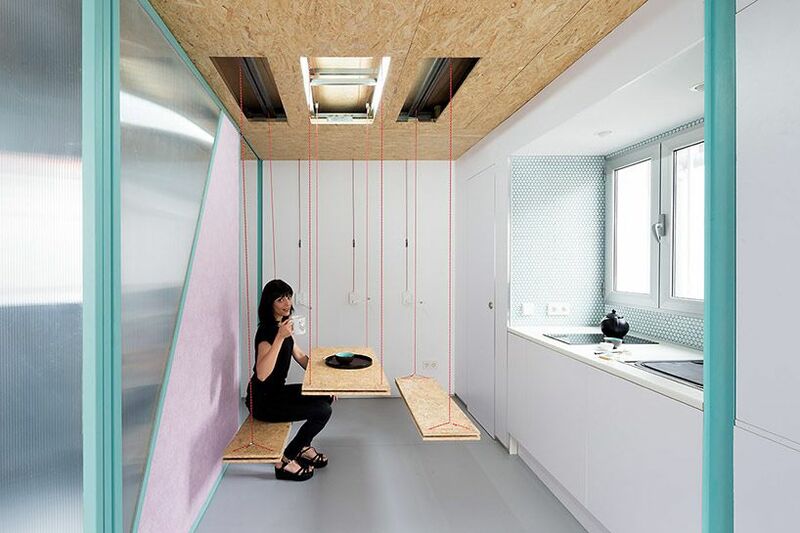 For example, the pint-size kitchen has a retractable dining set that lowers down from the ceiling. The table and benches make room for four adults. Need extra room for slicing and dicing? That's not a problem in this tiny kitchen thanks to a countertop that magically unfurls when needed. The tiny living room in this crash pad is too small for an average-sized sofa. It is, however, the perfect size for this awesome little swing. Need to kick back to relax fully? ​This tiny living room is equipped with a hammock. Sure, living in an attic apartment like this one is especially tricky because there's not much headroom. This tiny bathroom tackles this challenge with a sunken tub and plenty of floor storage. The rafters overhead make standing up in this tiny bathroom impossible. This smart vanity, though, makes performing basic grooming tasks easy as pie. The bedroom is just big enough to accommodate a full-sized bed. And unlike the tiny bathroom, there's plenty of headroom. So how much did it cost to renovate this 620 square foot attic apartment? Around $75,000 USD.